Read up on education issues and win for your school! You're reading Ed100 because you want to help make schools better. But there's another angle, too: by learning about California's education system you can also win MONEY for your school's PTA. Whenever you complete a lesson on Ed100, you earn a ticket for your school on the Ed100 Leaderboard. Periodically, Ed100 holds drawings using those tickets as entries to win. The next drawing is coming up on June 4, 2019. See rules for details. No purchase is offered or required. Ed100 provides a practical way for parent leaders, teachers and community members to learn about education issues, one lesson at a time. Go to Ed100.org to sign up or sign in and start earning those tickets! Congratulations to the winners of past drawings! What is the purpose of the drawings on Ed100.org? These drawings encourage parent leaders to learn more about education issues and ideas now. The drawings also provide school organizations with a useful deadline to organize learning groups. You, personally, can’t win anything in these drawings. Zero. But you could help your school's PTA win. The largest prize is $1,000. Whenever you complete a lesson on Ed100, you earn a ticket in the next drawing. Whoa, that’s awesome! Who funds these drawings? The drawings are supported by Full Circle Fund, a non-profit organization. Ed100 originated as a volunteer project by members of Full Circle Fund. How much do tickets cost in the drawings? Nothing. It’s FREE to enter, and Ed100 is FREE to use. How do I enter? How do I get tickets for my school? 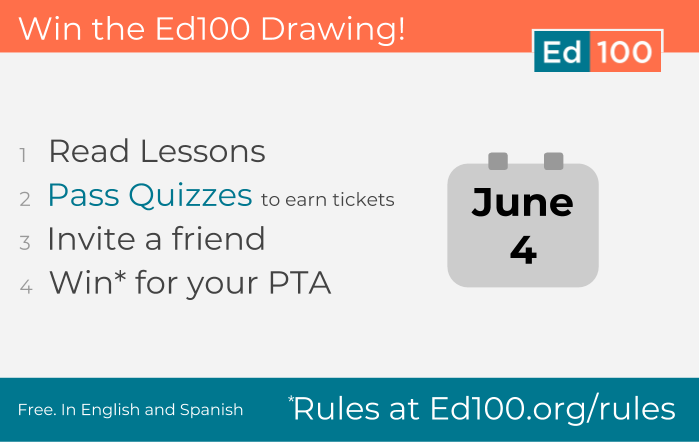 Sign up at Ed100.org, and earn tickets by completing lessons in Ed100.org. We call them "lesson tickets." You can also earn "bonus tickets," for example by completing all the lessons in a chapter or by inviting others to join in. Do I have to finish the whole course to win for my school? The Leaderboard shows the tickets that you earn on Ed100 by passing quizzes or by earning bonuses. The "current" view of the Leaderboard shows only the tickets you have earned in the current school year, reflecting the way that the drawings work. Each school year is a level playing field! All schools start the year with zero current tickets. Quizzes are all re-opened, so that you can review the lessons and earn additional, new tickets. Even Ed100 graduates can earn new tickets this way. The "All Time" view of the Leaderboard shows all tickets earned since the original launch of Ed100. Before the 2017-18 school year, the All Time view was the default. We changed it to encourage school groups not to rest on their laurels. Is my school eligible to win? See the rules for detailed eligibility requirements. The rules include an important requirement: at least two people from your school must sign up for your school's PTA to be eligible to win. The purpose of this requirement is to promote discussion, which takes at least two! My school's new to Ed100. Do we have a chance of winning? Yes. Each drawing selects ONLY from tickets earned in the current school year (more specifically, after the final drawing of the prior school year). How do I improve the chances that my school will win? Complete lots of lessons on Ed100. Each lesson you complete earns a "lesson" ticket. Whenever you finish all the lessons in a chapter you earn bonus tickets! Invite others from your school to sign up. Lessons that THEY complete earn tickets in the drawing, too! Plus, you can earn bonus tickets by inviting them! Invite people from other schools to join. You earn bonus tickets for spreading the word via email or social media. Add useful comments to lessons and posts, for example by sharing a link to an article or sharing your insights with other readers. You can earn bonus tickets that way. Keep at it! The drawing resets each school year. You can earn more tickets by reviewing the lessons even after you graduate from the course. Can teachers, administrators, students and community members join, too? YES, definitely. Use Ed100 to build your school community. How can I get the most out of Ed100? Who is operating the drawing? The drawings are operated by Ed100.org, a project of Full Circle Fund. Q: How can I know when future drawings will be held? Follow Ed100 on social media. How much can my school win? In past drawings, PTA units have been awarded prizes at two levels: $1,000 and $250. I'm interested in sponsoring a future drawing. How do I do that? Hi Ramiro, Welcome to Ed100--we are glad you're here. Sorry about that! I will contact you to address this issue. I am excited to include one lesson to our PTSA board monthly packet next year! Fantastic, Marilyn. Have you checked out our brand-new "Chapter of the Month" program? It's designed to help you and your board become Ed100 graduates together by the end of the 2018-19 school year. I look forward to hearing how your year goes! I have just recently joined Ed100.org and I have been learning a lot, and I am sharing the information with the School's PTA members to have more educated parents who can help their students. I just would like to know who do I need to contact to report some of the links which are not working anymore when click on them to find extra information on topics! Thanks a lot! Thanks, Shamrock 27 -- Please let us know about any broken links by leaving a comment like this one on the page where you find it. Curating web content is like teaching puppies to sit. I am so excited as a parent for my son's school having a chance to win $1000 from ED100. The PTSA has designated monies for senior scholarships and if we win this will increase the much needed money for college expense of the scholarship winners. As a property owner in California it was interesting to learn of how property taxes are allocated to the local school district and how monies are allocated to different school based programs and all the limitations there are for use of the funding. It is so important for parents and family members of students to keep themselves informed on issues and policies affecting our children because they are our future. Participating in these lessons has made me a more informed and involved parent. I attend more school meetings and spread the information to all who will listen. Learned so many things you didn't know about California's public school system. Budgets, Money, Hiring!!!! It is very interesting to learn about educational policies via this format. So many interesting topics on California's educational system. I find myself asking coworkers "did they know this or did they now that". Question / Comment for those earning Ed100 tickets: After speaking with several parents, I don't think the tickets connect if you use the LOGIN by FB or Google buttons. We're advising our PTA members to create an Ed100 account and specifically add their name and school name. Let me know if you have any info or advice. Thanks! I invited my friends on Facebook to join in and learn about the California educational system. I invited my entire middle school PTA board to join me in learning & earning tickets! King Drew invited and encouraged the entire PTSA membership to read, learn and earn tickets!!!!! The lessons are very informative regarding school issues and procedures. Thanks _MARTHA! We've just updated Ed100 to include a bunch of new content and functionality. I hope you like it! After lots of learning, I cannot wait to see what happened in the drawing! !